I love following a chart like the SPY that is trending and when price action gives us PBO’s (Pull Back Opportunities) followed by profitable swings. January 24th through January 30th was a perfect PBO opportunity with a swing to the Dotted Deuce and now possibly the 200-SMA on the SPY chart. When looking at the SPY, it is clear to see that the bulls have been in control climbing the wall of worry fending off the very obvious resistance starting on the January 15th candle. Unfourtiountly the bullishness can end in a split second, above $269.15 and up to $281.20 we feel will be like sailing through rough waters. Our navigation will be crucial getting past the rocks, sharks and pirates. Yesterday the “Live Trading Alerts Scanner” alerted us on a few great setups; I was able to capture terrific entries on X and GS. Now we will manage them based our proven trading rules. Three of my favorite scans are the Pop Out of The Box, The RBB, and the 3×6 Trap. 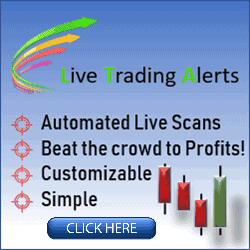 Yesterday we took profits on V, and WDC both alerted by the Live Trading Alerts Scanner. Todays trade-ideas came from Live Trading Alerts at the closing bell yesterday: NBR, X, LMT, URI, BBBY, HOME, IBM. Not all charts are a buy today, knowing trade ideas still require trading education and savvy. Past performance does not guarantee future results.